Eight-year-old Christopher Bowen of Dallas has reportedly been hospitalized more than 300 times and undergone 13 major surgeries ― and he may not have needed any of it. The arrest of Christopher's mother last week has caused some of the strange details of his story to come to light. 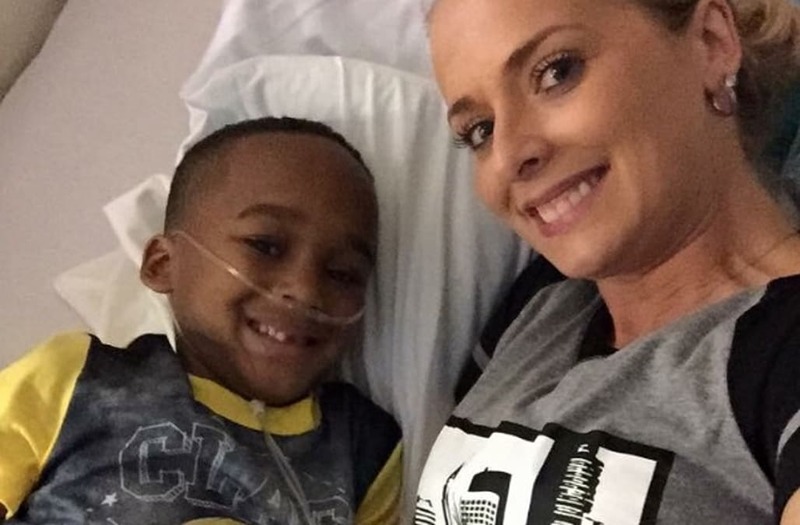 In 2014, when Christopher was 5, his mother, Kaylene Bowen-Wright, told CW33 TV that he had a rare life-threatening condition that affected his oxygen supply. She said he'd been diagnosed at age 2. "Christopher has trouble breathing so basically, his lungs ― and body ― doesn't get the oxygen it needs, so he gets tired," she told CW33 TV. "He can't play as long as the normal kids." The interview was conducted during a bike rally intended to raise $30,000 for Christopher's care. "We don't know how long Christopher will live," Bowen-Wright said. The following year, a friend of Bowen-Wright's used GoFundMe to raise $610 so Christopher could go to the beach. According to the fundraiser page, Christopher had been diagnosed with cancer and had just six months to live. "I want him to build sand castles, walk on the beach and let the waves hit him as he plays with his family," the organizer wrote. Later, when Christopher was a kindergartner at White Rock Elementary School in Lake Highlands, a YouCaring campaign was organized by a group of friends and supporters. By the time it ended, the campaign had raised roughly $8,000 "to help young Christopher and his family as they struggle against a disease that is slowly ending his life." Bowen-Wright was quoted on the campaign page as saying, "Sometimes in the midst of a dark time, you receive unexpected blessings when your community and church rally around you and lift you up." While Bowen-Wright was allegedly carting her son, his oxygen tank and his wheelchair from doctor to doctor, Ryan Crawford, the boy's father, was busy trying to convince Dallas County family court judges that Christopher was not actually sick, according to the Fort Worth Star-Telegram. Crawford claims that until recently, he had not been permitted to see his son since 2012. "It was always the same story: 'Christopher is dying. The father doesn't need to be around because he doesn't know to take care of him,'" Bowen-Wright would tell the judges, according to Crawford. "Every time I went to court, they made me feel like I was the worst human ever." Crawford claims Child Protective Services also ignored his suspicions. The agency reportedly claims to have no record of him contacting them. Little did anyone know how fooled they all had been, according to CPS records obtained by the Star-Telegram. The court documents indicate that CPS received a report from a doctor in November 2015, saying that testing had failed to find anything wrong with Christopher. The doctor, according to the report, suspected possible medical child abuse. When CPS interviewed Bowen-Wright, she denied any wrongdoing. The case was closed. In November of this year, CPS received another report from a different care provider. The report said Bowen-Wright told them she'd brought her son in for treatment because he'd had a seizure. However, an ECG machine did not indicate any unusual activity. The care provider further alleged that Bowen-Wright refused advice to wean her son off medications he was taking. "I am very concerned that mother has moved from exaggerating symptoms to inducing symptoms," the report read, according to the Star-Telegram. "If mother has given Chris something to induce a seizure, this is potentially fatal. At this point, I am very concerned for his welfare." An investigation was launched, and on Dec. 6 Dallas police arrested Bowen-Wright on charges of injury to a child with serious bodily injury, alleging that she caused Christopher's mysterious maladies. According to Bowen-Wright's arrest warrant affidavit, investigators suspect she began abusing her son when he was just 11 days old. The documents allege that Christopher ― who was hooked up to an IV and oxygen at the time of his mother's arrest ― does not have cancer and was put through repeated unnecessary medical visits, hospitalizations and procedures. "Christopher's history provided verbally by Ms. Kaylene Bowen-Wright paints a picture of a very sick child," the affidavit reads. "The doctors do not find Christopher to be sick. Ms. Bowen-Wright has Christopher on oxygen, yet Christopher is fine without oxygen. Christopher is able to eat normally and does not need a feeding tube." Christopher has since been placed in foster care. His father is still fighting to gain custody of him. "Out of everything that has happened, the worst thing you can do is put my children in foster care with strangers," Crawford told the Star-Telegram. "I need my son in my life and my son needs me in [his] life." Friends and co-workers have set up a GoFundMe to help Crawford hire a new attorney. Bowen-Wright, 34, is being held at the Dallas County Jail in lieu of a $150,000 bond. A court date has not yet been set.